Some annuals and vegetables grow best if the seeds are sowed where the plants will be grown in the garden. Sow seeds in rows. Use a trowel or the corner of a hoe to dig a furrow to the correct depth (check seed packets for depth and spacing recommendations). Sow the seeds evenly, and pat the soil gently over them. 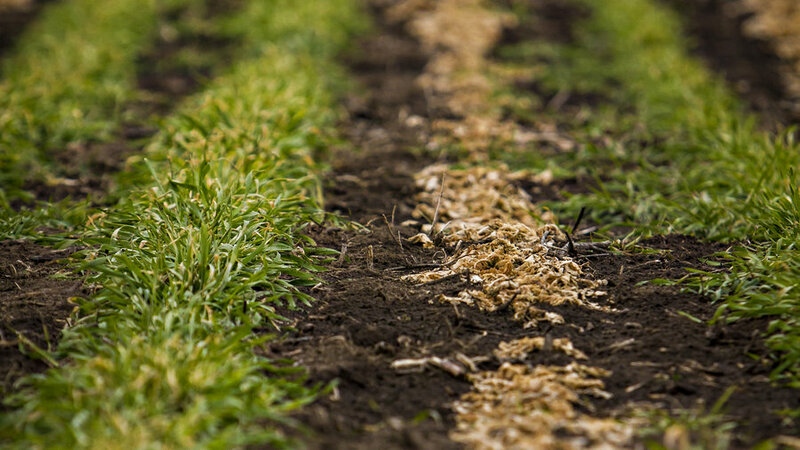 To make straight rows, stretch a string between two stakes, and plant beneath it. Or lay a board on the soil’s surface and then plant along its edge. Make a mound. Group plants in a cluster on a low mound of soil, rather than in rows. This is a traditional way to grow sprawling plants such as squash and melons. Sow five or six seeds in a circle, and pat soil over them. Broadcast seeds. Sowing wide bands of vegetables across a bed is more space efficient than row-planting for smaller crops such as lettuce, carrots, radishes, or mesclun. Scatter the seeds evenly over the soil. Cover by scattering soil over the seeds or by raking gently, first in one direction and then again at right angles. Pat the soil to firm it. For most annual flowers and vegetables, sow seeds indoors four to eight weeks before it’s time to plant the seedlings outdoors. Fill, sow, and label. Use small pots or cell-packs, and fill to just below the rim with a light, porous seed-starting mix. Moisten the mix; let drain. 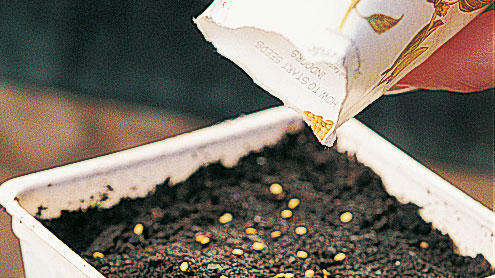 Follow the guidelines on the seed packet, and cover seeds with the recommended amount of mix. Moisten lightly, and label your containers, since many seedlings look alike. Care. When the soil surface feels dry, spray with a fine mist. Once seeds germinate, move the container to a warm area with bright light. As the seedlings grow, thin out the weakest ones. About 10 days before planting out, harden off the seedlings by setting them outdoors for a few hours each day to get them acclimated. Water each seedling before removing it from the container. 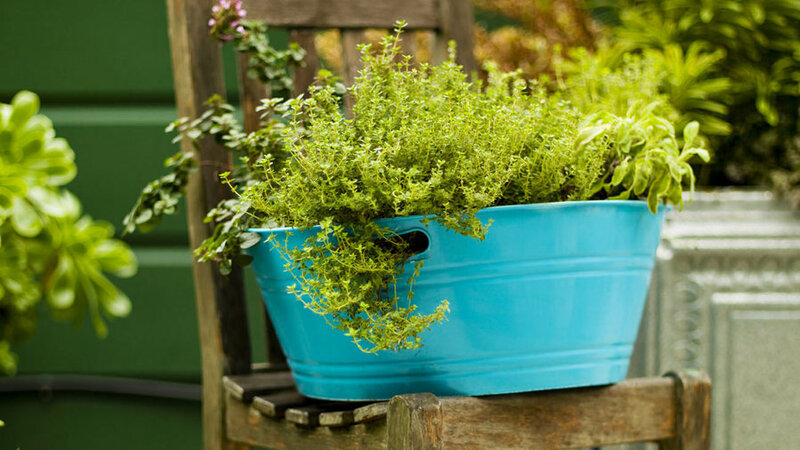 The hole for each plant should be the same depth as the con­tainer and 1 to 2 inches wider. Loosen the roots. 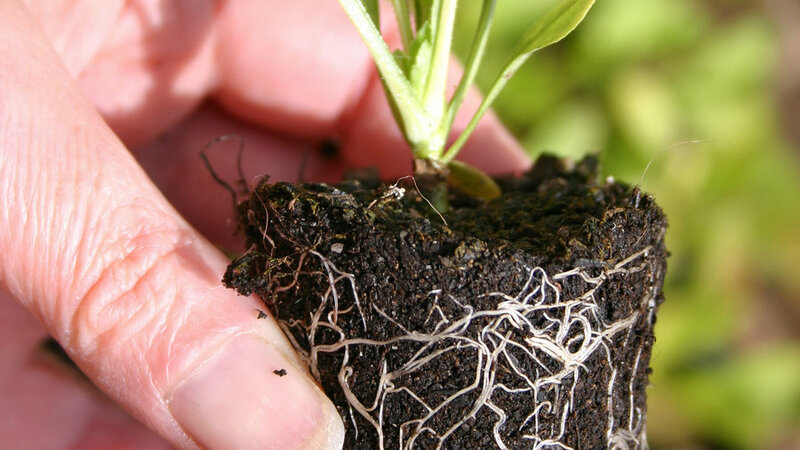 With your fingers, lightly separate the roots so that they can grow out into the soil. If the bottom of the rootball has a pad of coiled roots, pull it off. Plant. Place each plant in its hole so that the top of the rootball is even with the soil surface. Firm the soil around the roots. Water. 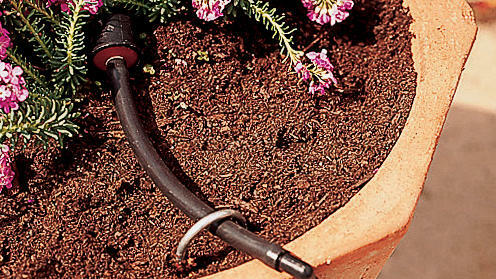 Irrigate deeply with a gentle flow that won’t disturb the soil or roots. 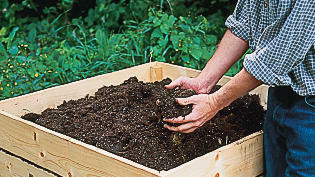 Composting is a natural process that converts raw organic materials into valuable soil conditioner. A pile of leaves, branches, and other garden trimmings will eventually decompose. You can speed up the process by creating optimum conditions for the organisms responsible for decay. You will need “browns” (such as dry leaves, twigs, sawdust, wood chips, or shredded newspaper) and “greens” (like fresh grass clippings, fruit and vegetable scraps, coffee grounds, tea bags, crushed egg­shells, or aged steer or chicken manure). Shred or chop all materials into small pieces. 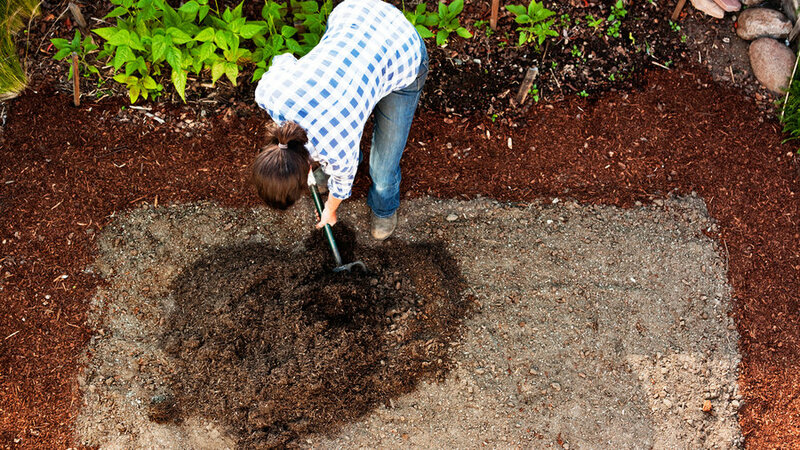 Common amendments such as compost, manure, wood products, and sphagnum peat moss will replenish your soil. Here’s the best way to add amendments. Dampen the soil. Water the soil thoroughly and let dry for a few days. Dig the soil. Go to a depth of about 10 inches. Break up dirt clods, and remove any stones or debris. Add the amendment. Spread it over the soil. Add fertilizer according to package directions, if desired. Mix with a spading fork, incorporating the amendment evenly into the soil. Level the bed with a rake, breaking up any remaining clods of earth. Water well. Let the improved soil settle for a few days after watering. Getting started is easier than you think. Follow these steps, and you’ll be harvesting in weeks. 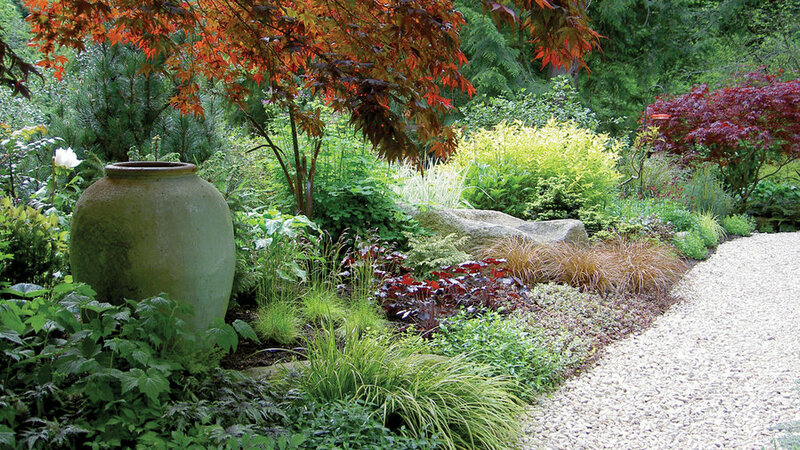 Try low-care plants in light, breezy colors. 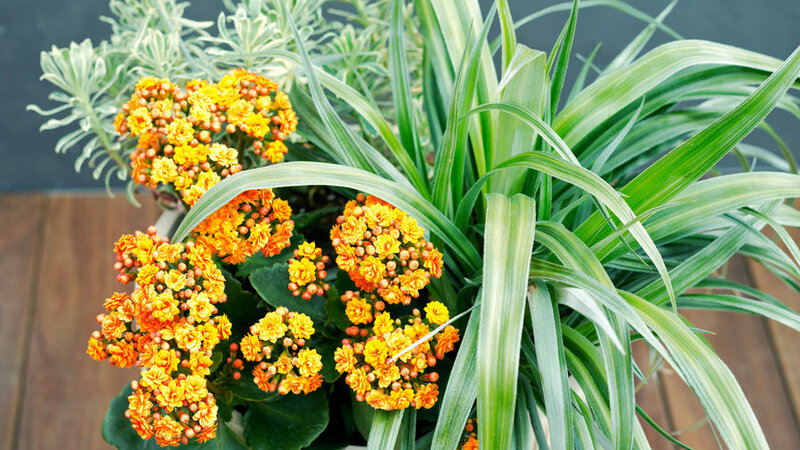 Arching, silvery astelia leaves and variegated ivory and pale green euphorbia create a lush, stunning backdrop that sets off bright tangerine blooms. The combination is soft and vibrant at the same time. Kalanchoe calandiva ‘­Goldengirl Yellow.’ Fluffy clusters of tiny blooms in a bright citrusy shade rise above fleshy, deep green leaves. Astelia ‘Silver Shadow.’ This perennial has shimmering, strappy foliage in a clump that reaches 3 feet high and wide. Euphorbia characias ‘Silver Swan.’ Mint-and-cream leaves topped with nearly white blooms grow about 2 1/2 feet high and wide. Want to save yourself some substatial watering time? Switch to drip irrigation for your containers. Your plants will love it and it’s not any harder than playing with Legos. Don’t want to lose the use of your garage? 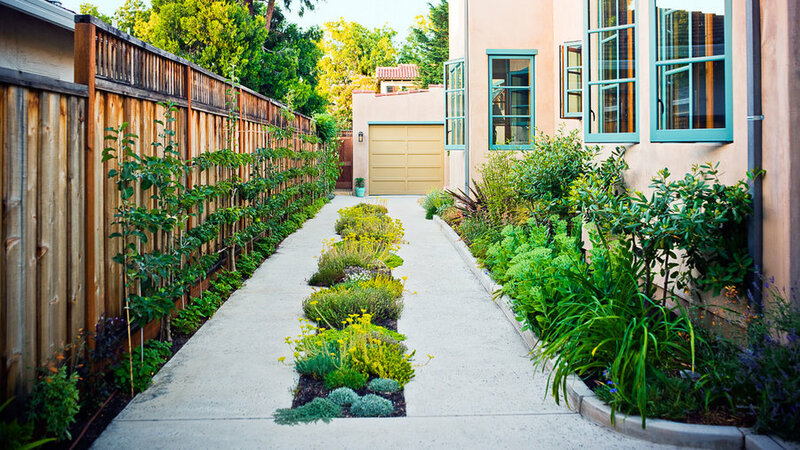 Create a planter down the center of the driveway, and place in it creeping thyme, sedums, star creeper—anything short enough that cars can pass over it will work. Immediately the whole area looks softer. Now squeeze in some taller plants along both sides. 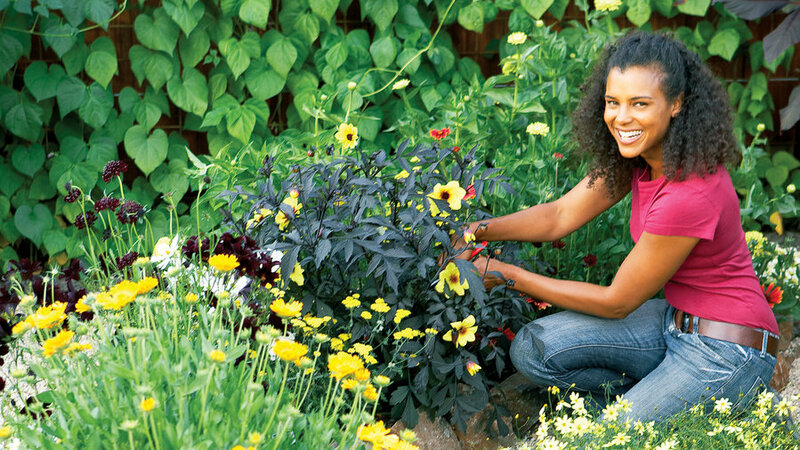 If you’re really short on space, espalier—train plants to grow sideways. You’re greening up vertically as well as horizontally. There is something about a curve that makes you want to follow it, especially when it ends in an inviting place to sit. Big drifts of chartreuse-flowered euphorbia brighten both sides of the path, and blue and white flowers and silvery foliage add contrast. Aromatic herbs release their scent along the way, inviting you to linger. A flaming Acer palmatum ‘Bloodgood’ arches over this border on Bainbridge Island, Washington. Beneath its canopy, Heuchera ‘Blackout’ repeats the tree’s red highlights and adds punch beside a pale green sedum and coppery Carex flagellifera. The filler plants, listed below, add contrasts of color, texture, and scale. Hair grass (Deschampsia flexuosa). Fine-­textured grass sports airy clouds of pale yellow-green flowers in summer. It grows 1 to 2 feet high and wide. Japanese sweet flag (Acorus gramineus ‘Ogon’). Small, grasslike perennial, 1 foot high, has golden yellow, narrow leaves. Spirea (S. japonica ‘Goldflame’). Foliage on this upright deciduous shrub starts out bronze but matures to yellowish green, turning reddish orange in fall. It grows to 2 1/2 feet high and wide. 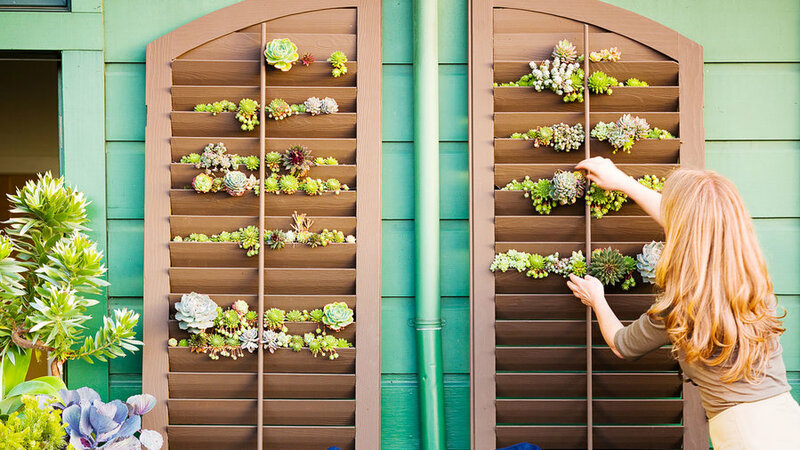 A miniature succulent garden has an irresistible appeal. It’s easy to assemble and care for. As a bonus, it can be moved from place to place. 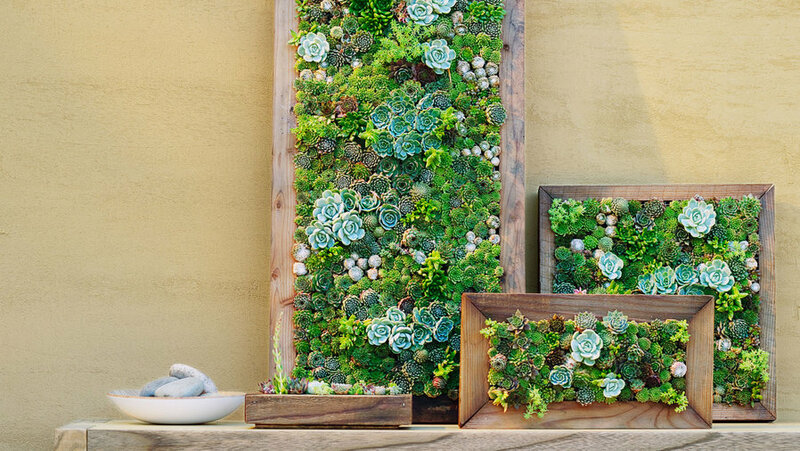 Ready-made succulent frames in various materials are available online from Succulent Gardens () and other sources. Insert a box with drainage holes into an old table. 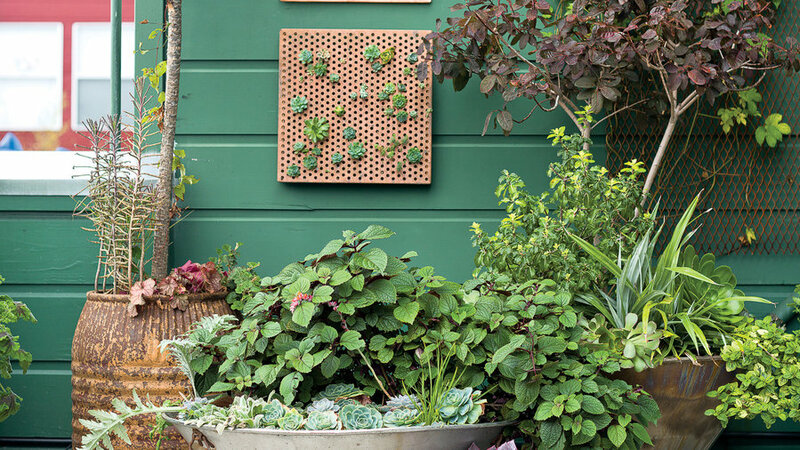 Fill your new planter with easy-care succulents. Now you have a centerpiece that will last the entire outdoor dining season. Don’t have an old table to sacrifice to the project? Build one out of shipping pallets. 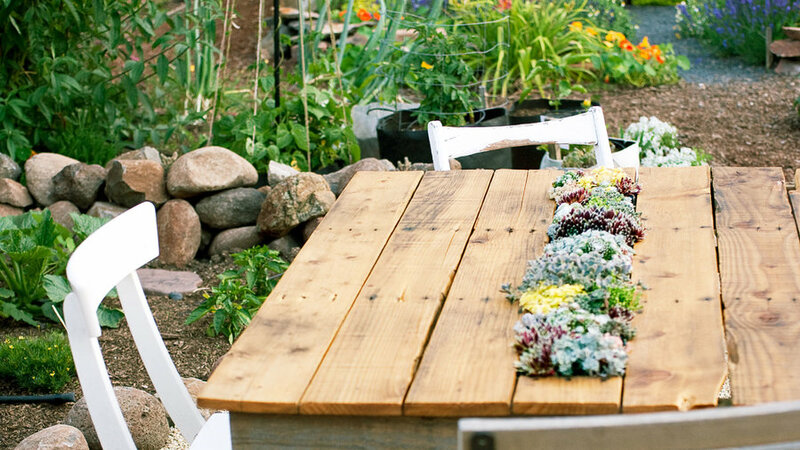 Use the pallets for the top and the sunken planter, and add legs—the more worn, the better. Coat the table with some natural wax stain for a bit of weather protection. An herb garden has many pluses. It is both aromatic and attractive. It is water-wise. And it provides fresh seasonings just steps away from the kitchen. The garden here hosts old favorites like parsley as well as newer introductions, such as conehead thyme (similar in flavor to winter savory) and Italian oregano thyme (a thyme with oregano overtones). All are perennials, with the exception of parsley, which can be planted each fall or early spring, as climate dictates. Italian oregano thyme. 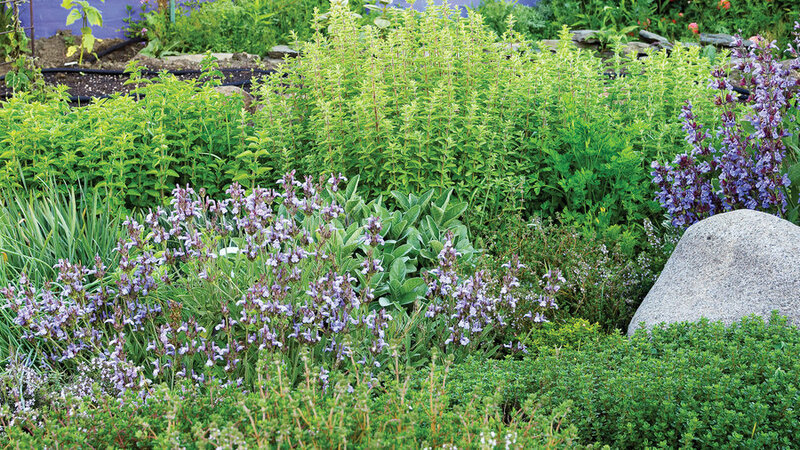 Leaves of this 1-foot-high herb have a zesty thyme flavor that enhances tomato-based dishes. English thyme. The spreading plant, up to 1 foot high, has small roundish leaves used to season meats, stews, and tomato-based sauces. Lemon thyme. Leaves have a pleasing lemon fragrance and subtle citrus flavor. The spreading plant grows up to 1 foot high. Garden sage. Shrubby perennial, 1 to 3 feet high, has velvety leaves and bears lavender-blue flowers from late spring into summer. Add to stews. ‘Berggarten’ sage. This compact grower reaching about 16 inches high has soft grayish green leaves and fewer flowers than other culinary sages. Delicious in stuffings and gravies. Conehead thyme. Leaves from the 3-foot-high mounding plant taste like thyme with the heat turned up. The spicy purple blooms are used for garnish. Flat-leafed parsley. Fresh sprigs and minced leaves are classic garnishes. Height ranges from 6 to 12 inches. Greek oregano. Fuzzy gray-green leaves have a spicy flavor. They are at their strongest if harvested when the plant is in bud but before it flowers. Want to pick flowers for bouquets month after month? Plant a cutting garden. 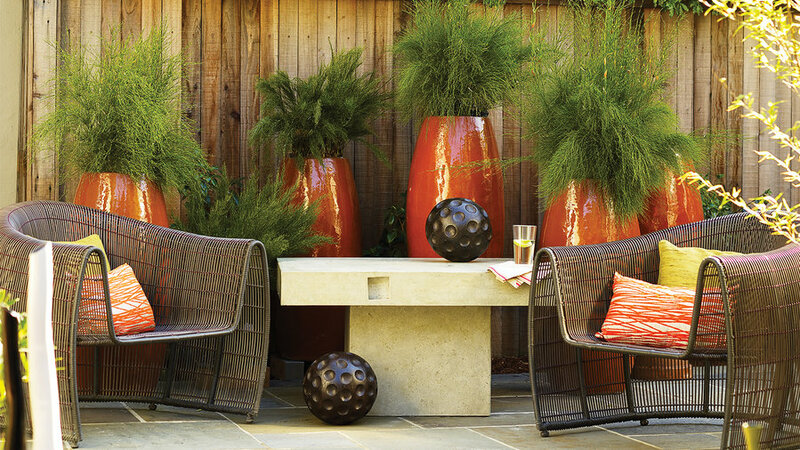 For a striking look in both garden and vase, choose plants with contrasting hues. The bed pictured here emphasizes sunny yellows, oranges, and reds. Splashes of chocolate, deep purples, and burgundies temper the fiery tones. Plant tall growers in the center or toward the rear, and position trailers, such as calibrachoa, to soften the bed’s edges. Cut flowers early in the morning or just after sunset. Bring along a bucket of tepid water, and plunge the cut stems in the water. When arranging the blooms, recut each stem underwater. Then pull off any foliage or flowers that will be below the water level in the vase. ‘Oranges and Lemons’ gaillardia. Daisylike blooms in bright orange and yellow grow on plants 1 1/2 feet high or more. Calibrachoa. Flowers, ­available in many colors, resemble dainty petunias. Trailers reach 6 to 10 inches. ‘Mystic Desire’ dahlia. Bright scarlet flowers with chocolate centers rise 2 feet above blackish brown foliage. Salpiglossis ‘Chocolate Royale.’ Velvety trumpets in rich browns grow on 1-foot-high plants. ‘Benary’s Giant Lime’ zinnia. Plants 2 1/2 to 3 1/2 feet high bear cool lime-colored flowers. ‘Sonata White’ cosmos. White blooms up to 3 inches across grow on plants 1 1/2 to 2 feet high. With a few easy-care flowers, you can turn a forgotten corner of the garden into a pollinator bar for all kinds of winged creatures. 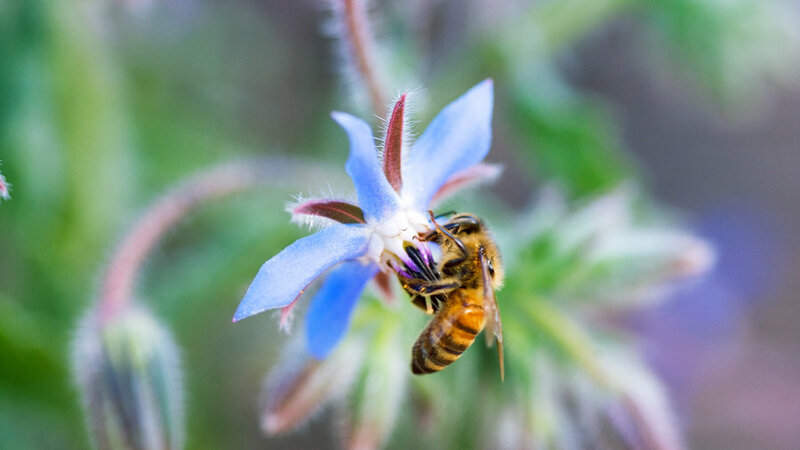 Bees, butterflies, and hummingbirds will eagerly, if unknowingly, take on the task of transferring pollen from one flower to another as they forage for nectar or pollen, ensuring better crops for your fruit and vegetable plants. Flitting among the brightly colored summer flowers such as yellow yarrow (Achillea) and pink coneflower (Echinacea), they’ll also bring beauty and motion to your garden. Insert tiny pocket gardens here and there. This arrangement of Echeveria rosettes and Senecio mandraliscae is a good example of what to aim for. Several plants, several foliage colors, several shapes. Everything you’d do in a regular garden but in miniature. How can you not pause to admire the composition? 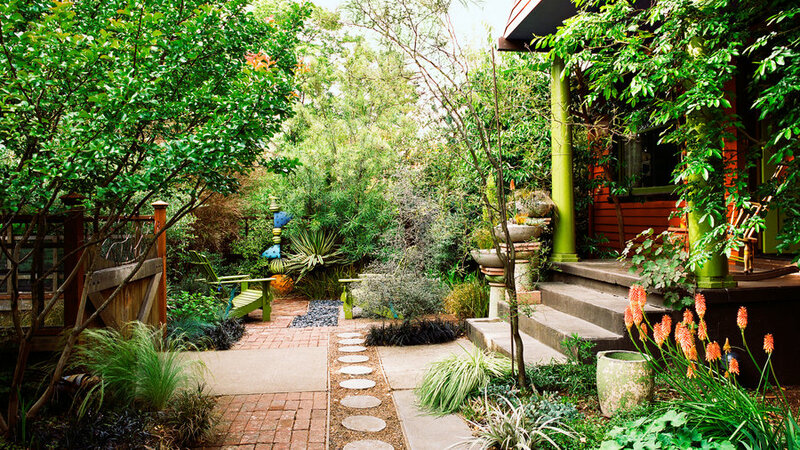 This inviting backyard feels mature, but the plantings are actually quite young. Clever camouflaging and colorful distractions simply create the illusion that it is well established. Pop in plants. Set in potted plants straight from the nursery to hide bare spots in the garden. The ferns in the foreground, for instance, are all new arrivals. Set a green table. 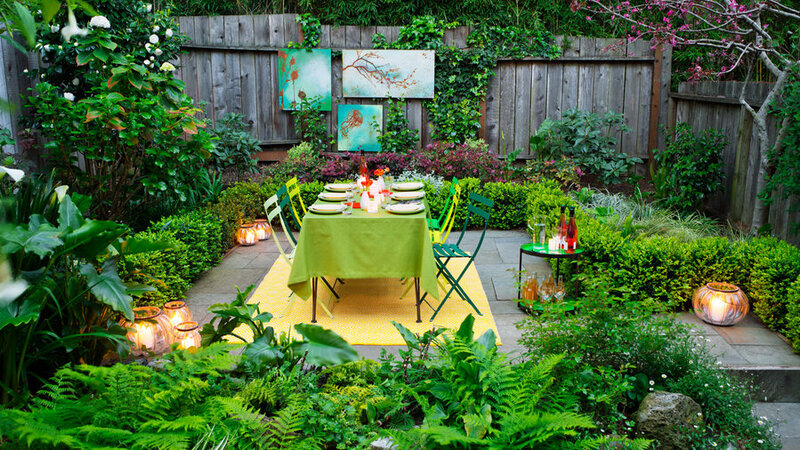 Make the garden feel lusher by bringing in other shades of green in furniture and accessories, as was done here with the bistro chairs, chartreuse tablecloth, and emerald minibar. Steal from the indoors. Use your good china, glasses, and flatware. Fill some vases. Maybe even borrow an indoor rug for the evening. Make the table—and by extension the guests—the focal point. Illuminate with footlights. Candles in clear vessels clustered in corners serve dual purposes. They make the space safer—no one tumbling over hedges or stumbling on stairs. But they also make it look more theatrical, and your guests will feel like stars. 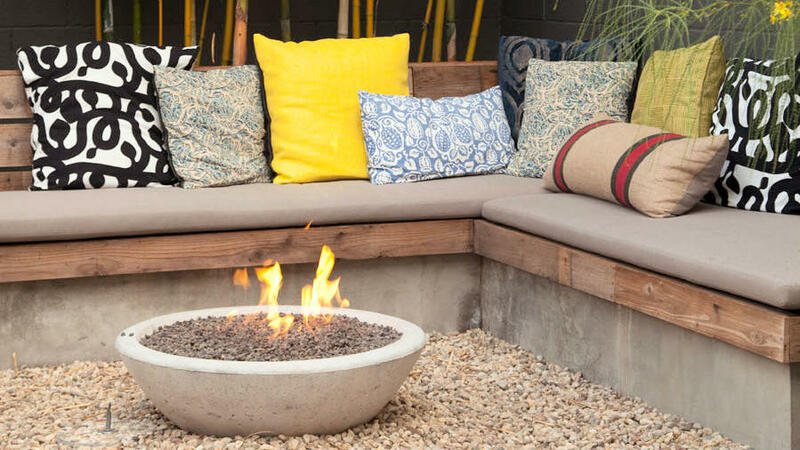 Deck out a patio in a crisp, contemporary motif with these techniques. Use big containers. A few large pots create a lot of drama; a dozen small ones go unnoticed. Select one primary color. Go with one hue—say, orange—and use variations of it for variety. Go vertical. Line up a row of imposing tall, narrow pots along a bare wall. Keep it simple. Use just a few plants with strong textures—the restios in orange pots along the fence, for instance—to accent in streamlined style. 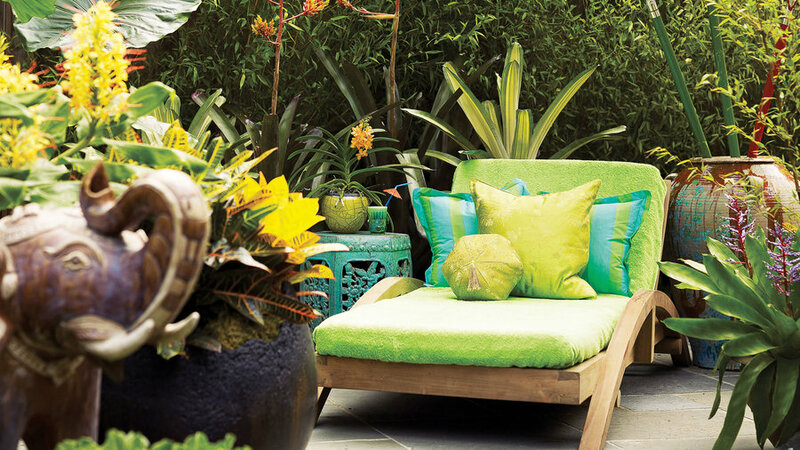 Go for a tropical island vibe with these easy design tips. Use big pieces. It may sound counter-intuitive, but petite furniture makes a small space seem tinier. A few oversize pieces, especially chairs, on the other hand, make it feel more generous than it actually is. Keep the color range narrow. Use analogous colors—ones next to each other on the color wheel, such as yellow and yellow-green. Too many competing hues in a tight space are jarring. Take advantage of vertical space. Hide it with a row of clumping bamboo. Then stick a bouquet of Balinese umbrellas in a pot to show off against the green background. Reinforce your theme. Go for a lush look—giant leaves (elephant’s ear), bright plants (croton), and glamorous tropical flowers (orchids, brome­liads, ginger). 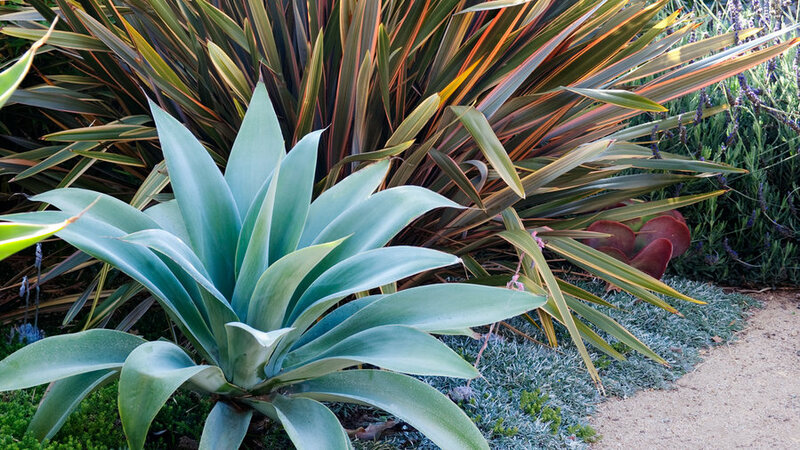 The two stars of this small SoCal garden's border are a muscular icy blue Agave ­attenuata ‘Nova’, which grows 5 feet wide, and a towering New Zealand flax (Phormium ‘Sundowner’), which grows to about 6 feet tall and wide. The filler plants, listed below, set off these bold beauties. Dymondia margaretae. Short (2 to 3 inches high), dense groundcover has narrow gray-green leaves rolled at the edges to show cottony white undersides. Drought-tolerant once established. Echeveria ‘Afterglow.’ The small succulent grows in a loose rosette shape. This variety sports a particularly striking color—lavender-pink leaves with a powdery finish. Golden bamboo (Phyllostachys aurea). Large grass with woody stems is dense and upright. Growing 6 to 10 feet tall, it makes a good screen. Foliage is a soft neutral green. 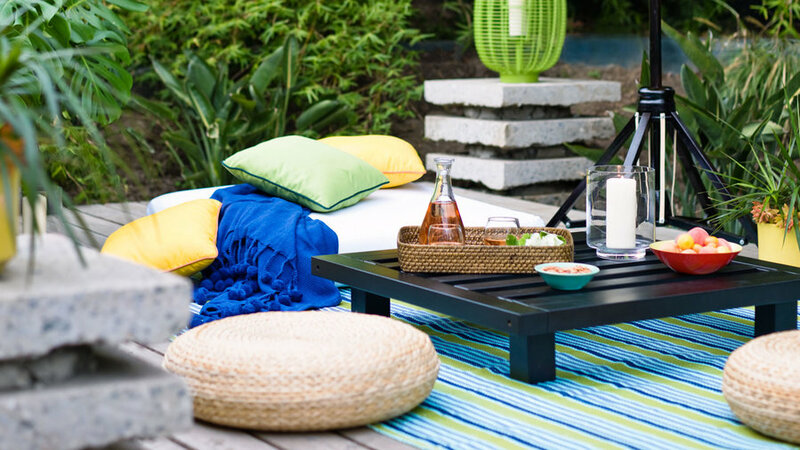 Furnishing your deck in an unconventional way that requires less furniture will surprise your guests for sure. Doesn’t that sound like a good way to start a party? Forget chairs. Provide lots of cushions on a soft rug instead. The change of perspective will amuse your guests and put them in a festive mood—after all, it’s hard to be uptight when you’re sitting on the floor. Improvise a low table. The one used here is actually the base of an ottoman. Its white cushion top is used on the rug for sitting. Or saw the legs off a garage sale find and give it a quick spray-painting. Pick the right rug. Since it will be the first thing your guests notice, its pattern should be strong and striking. A simple graphic design, like this blue, yellow, and white stripe, is ideal. The sunny yellow pot below echoes the similar color in the rug. Provide portable shade. Umbrellas cost a lot less than permanent structures and are more flexible. Take them down at night to gaze at the stars, or move them away completely for dance space. A laundry tub is large enough to hold lots of plants and costs much less than a ceramic one of comparable size. A coat of bright paint hides its origins. No garden walls to train ivy on? Plant between the slats of salvaged shutters. Staple weed cloth together to form pockets for soil, and attach the pockets to the back of the shutters. 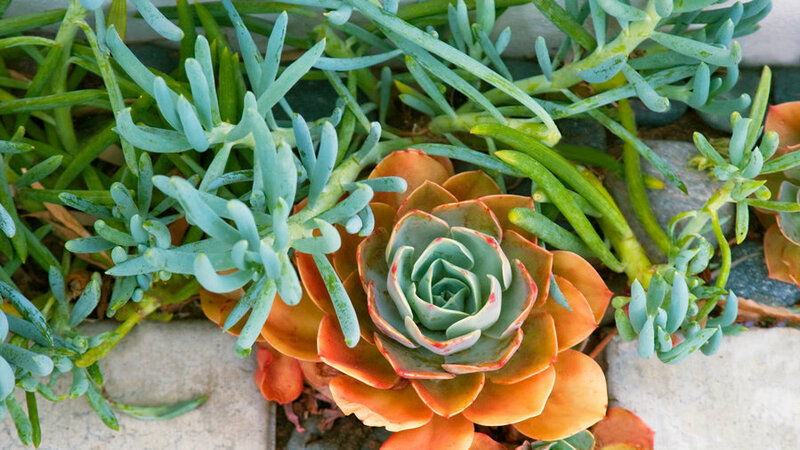 Plant with easy-care succulents. Group planted pots in various sizes together to create a similar effect. For interest, choose a variety of sizes and shapes. Here, all the pots are metal. If you use different materials, keep them in the same color range. 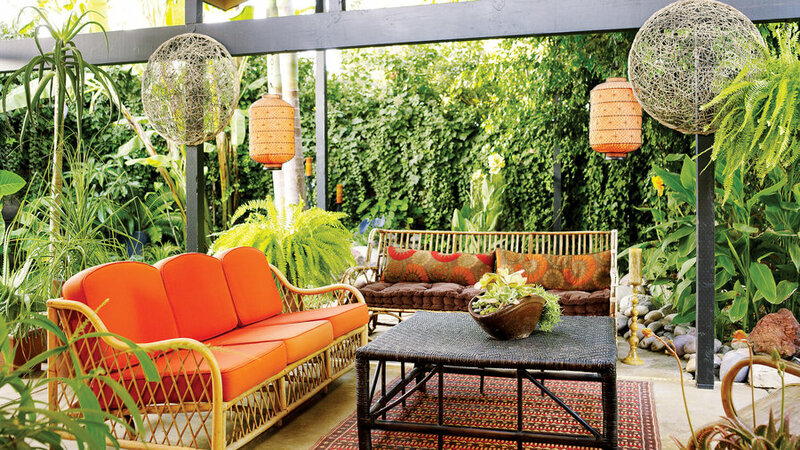 This sheltered patio feels as lush as a tropical resort, but it was created with a tiny budget. Its secret? Everything in it was either recycled or purchased at bargain prices. Re-cover furniture. The sofa at the back was bought at a swap meet; the second one was found abandoned in an alley. With new cushions, both pieces are back in business. The wicker coffee table was a sharply discounted floor sample. The few dings just give it character. Use candle power. To enjoy your garden after dark, you need lighting, but who says it has to come from electricity? Candles in hanging lanterns illuminate the space without the expense of wiring. And more romantically too. Add passed-along plants. Many of the plants, like the Yucca gloriosa variegata below, were rescued from a friend moving out of state. Others started as cuttings. Save on accessories. Purely decorative items, such as the loosely woven baskets hanging from the beams, are good places to economize. Shop for them at import stores, and scour garage sales and swap meets. A white sailcloth roof over a simple square frame creates protection from overhead sun in this outdoor seating area. It also makes the space feel like a poolside resort. If you have multistory residences on either side of your home, as was the case here, a shade canopy adds privacy. Plop a row of pillows in an assortment of fabrics on a built-in bench, and who could resist dropping in? Glass balls floating in a small square pond add a dash of color and humor to this narrow, mostly green garden. Don’t have a pond? Float glass balls in a large bowl of water. This will have the same effect. 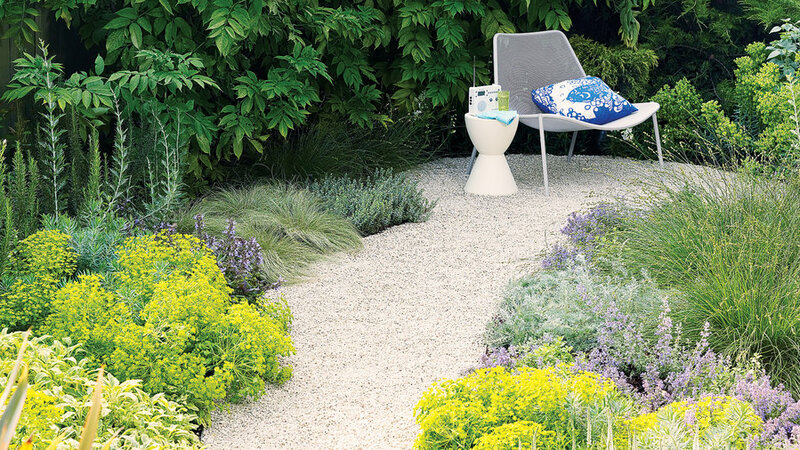 A hip-high ceramic pot in a glossy azure blue provided the inspiration for this garden. The homeowner converted the container into a focal-point fountain and repeated its color lavishly throughout the whole space. Paint. Normally, who pays attention to a standard terra-cotta pot? Wainscoat the bottom half a contrasting blue, though, and everyone notices. Fabric. A rusty but still serviceable wrought-iron sofa looks fresh again thanks to a coverlet made of striped sheets. No upholstery costs needed for this shabby-chic look. The area rug under the coffee table, which reinforces the outdoor room feel, is made of recycled plastics. Metal. An inexpensive candle lantern takes on a new personality when painted tangerine. 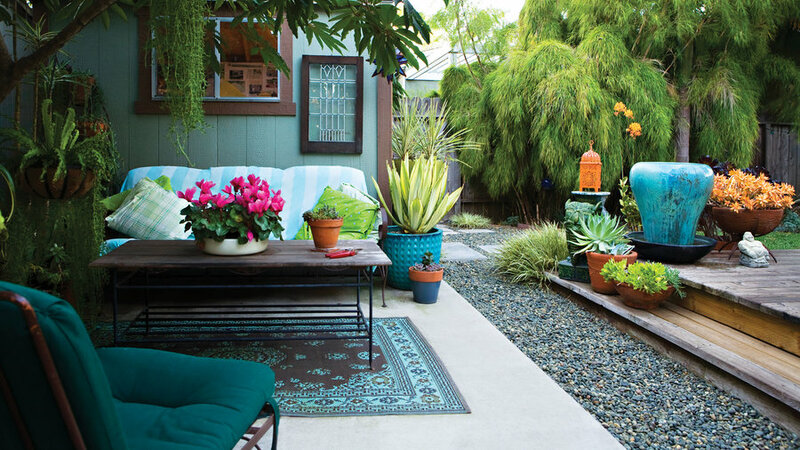 The warm shade complements the cool blues in the ceramics and fabrics, and picks up the coppery succulents in the nearby pot.